The first screening camp for the differently-abled and elderly persons was held at Algapur block development office in Hailakandi district on Sunday. Organised by the Hailakandi district administration and Artificial Limbs Manufacturing Corporation of India (ALIMCO) in collaboration with WODWICHEE and Barak Valley Handicapped Development Society, as many as 72 people with various disabilities and 67 senior citizens participated in the camp. Team of experts and doctors screened the persons and submitted a report based on which assistive devices like wheelchairs, tricycles, hearing aids, speaking devices, artificial limbs etc will be provided free of cost to assist them in their daily lives. 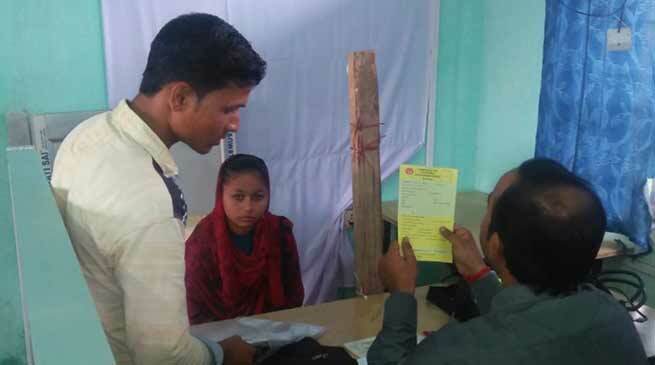 “It is a unique initiative of the district administration with ALIMCO to provide a healing touch to the people with special needs,” said Additional Deputy Commissioner and incharge District Social Welfare Officer, Amalendu Roy, who was present at the camp with Circle Officer, Algapur, Arpita Dutta. Screening camps will also be held at Hailakandi on October 29, Lala on October 30, Katlicherra on October 31 and South Hailakandi on November 1, informed Roy. Following assessment of the extent of the need of such people through the screening camps lists will be prepared and assistive devices will be provided by ALIMCO, an autonomous body under the Ministry of Social Justice and Empowerment. The assistive devices will be provided under the Assistance to Disabled and Impaired Person (ADIP) and Rashtriya Voyoshri Yojana (RVY). RVY was launched in December 2016 for providing assistive devices to senior citizens from the BPL category and the first distribution camp under the scheme was held in Nellore district in Andhra Pradesh on April 1 last year. The ADIP scheme has been in operation since 1981 and has been revised with effect from April 1, 2017. The objective of the scheme is to provide assistive devices to differently-abled to promote their physical, social and psychological rehabilitation and to enhance their economic potential.